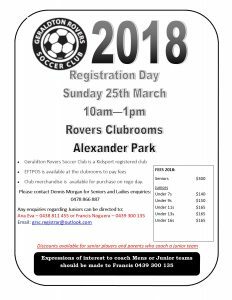 - Geraldton Rovers Soccer Club 2018 Registrations Now Open!!! Be Quick to secure your spot for the 2018 season. Stand by your club that provides the best facilities and training all for the lowest fees in town! ← 2018 Registrations are now open!! !